The RAVN show was on Saturday, and it was at super cinema, we went in and we removed the shoes then we entered a room that had a circle in the center where inside we had to sit. I was very impressed fom the actress who sang very well and in the manner in which she played the parts, with great courage and enthusiasm, and I also liked the shadows; the actress‘s name was Gretel and she was very nice. In the end her friend named Eva Maria was very good in cutting out figures without even draw them. She also showed us how to do some animals and I really liked it. The 1st and 2nd B we went to see a show named Ravn to Supercinema. I’ve been impressed by the story of the duck and I liked the ending when EVA MARIA made for us scraps to make shadows, and she had the generosity to give them to some of us, as a gift. One Saturday we went to see at SUPERCINEMA RAVN in ENGLISH. I was struck by how it was played; actresses were GRETE and EVA MARIA and at the end EVA – MARIA has cut the figures of a lion, a bear and a chicken and have given them to some children. For all this reasons I liked it. One Saturday we went to see a performance at Supercinema in English; the thing that struck me the most was when Grete sang as she went around with a wheelchair, the actress was very good and sometimes came among us that we were in a circle. The show was almost over and Eva Maria showed us figures with their shadows. Anyway I liked the show. 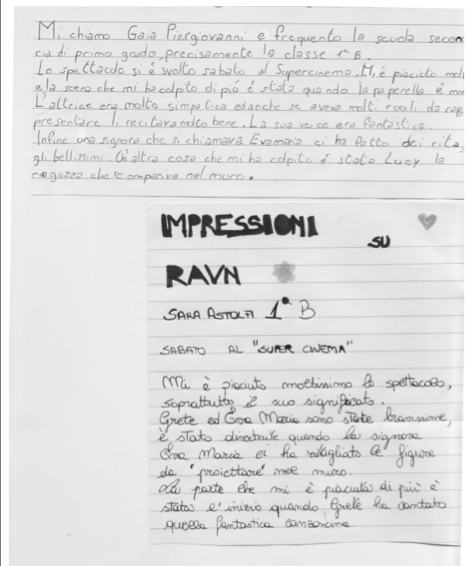 My name is Gaia Piergiovanni and I attend the first level of secondary school, I’m exactly in the 1 B class. The show was held Saturday at Supercinema. I really enjoyed it and the scene that struck me the most has been when the duck was dead. The actress was very nice and even though she had many roles to represent, she acted always very well. Her voice was fantastic. Finally a lady called Eva Maria made for us beautiful clippings. Another thing that struck me was Lucy, the girl disappearing into the wall. I loved the show, especially its significance. Grete and Eva Maria were very clever; it was fun when mrs Eva Maria was cutting for us figures to be projected figures on the wall. The part that I liked most was the beginning when Grete sang that wonderful song. They made us get into a circle and the show was taking place all around us! The thing that struck me was when Eva Maria showed us her embroideries. The actress Grete sang beautifully! This show is fantastic the most beautiful ever seen! That Saturday was a bit boring because I didn’t enjoyed it. The part I liked the most was when Grete came within the circle where 1st and 2nd B were inside without shoes and sitting on the ground. The part that I liked so much was when Eva Maria did the shadows with colored paper. This Saturday at supercinema we were all around a circle. I’ve been impressed from the part where the girl spoke of the adventures of the father. The actress was very good and very energetic and had a beautiful voice. The final for me was a little less fun, but I liked the play. A Saturday with the English teacher we went to see Ravn at the theater Supercinema. We went with the bus and then we stepped inside. I’ve been impressed especially from the way we were stuffed: we were sitting, barefoot, on the ground in a circle. Then I’ve been impressed from Grete’ s voice changes, and from Evamaria ‘s lights: with a few things, but surprising,. One Saturday together with my class we went to the theatre Super Cinema. When we entered we were asked to remove our shoes and sit on the ground inside a circle. Of the show, more than all the other things, the shadows struck me. About the actress, Grete, I can only say that she was very good and she was good both to interpret all the roles and ..
My class and I went to see the show RAVN at Super Cinema. It was on Saturday, October 15. We were in a dark room in a red circle. Before entering the room we had removed our shoes, otherwise we could have dirty around, and then we went to sit inside the circle. The thing that struck me the most was when a lady named Eva Maria, in less than a minute did the silhouettes of animals, with only paper and scissors. The actress was named Grete and she was very good!! The end I imagined could have been different, but the show was beautiful. One Saturday, a few weeks ago I and class 1 B went to Supercinema. We sat on the floor, without shoes. This idea I liked a lot, I was struck, in the hour of the show I tried very intense emotions, it was like teletransfer to another dimension, a dimension of enchanted stories, it seemed really to be in the world told by the show. The shadows seemed true, they were moving. had any problem, I understood the story well, I liked when the actress approached us and talked to us and also the projections of shadows were perfect. The actress (Grete) I think is a fantastic person, educated, kind, and I really enjoyed talking with her, she seemed kind and nice, and I was fantastically amazed from her voice that was beautiful, intonatissima. I make many compliments to Eva Maria, the lady who made us fly, together with Grete, in the world of RAVN and I was surprised from her speedness and her skillness in cutting shadows of animals or whatever and the generosity to give them to us as a gift. In short, at the end Grete and Eva Maria surprised me and this was one of the best shows that I attended. The show Ravn has really been a good experience! More than a show, in fact, it has been an experience. Sitting on the floor, without shoes, in a circle, in a theatre that is not a theatre but an old cinema like Tornatore’s “new paradise cinema “. Among the boys, curious and happy, some of them could understand more and I saw those who were trying not to miss a single gesture to understand everything. Very strong the story of the girl who is hiding in the wall, some of them are as Lussi and suffer much. The actress, very good with an impressive voice, was transforming from an old man to a child with a delicacy and an impressive professionalism. What to say.. Beautiful ! We wait for you next year.